…and some days, won’t get in. Other Days, she won’t get out…but I will come back to this story after the other events of my week. This week, I almost didn’t get the knitting in. It’s been a busy week of a joint birthday party for my Little, Mariah and I; and borrowing my nieces-ages 12 and 14 respectively. Oh, And a half…for both of them. Their math is even mostly right, the twelve year old has two more weeks to the actual half. Alas, we gathered for celebrating my birthday(Tuesday, August 9) and Mariah’s birthday which was June 23. She turned 11 this year, and don’t you forget it;-). No, ladies, I am not disclosing my age, I enjoy that my youthful face earns so many flattering guesses. That, or those young whipper-snappers just look younger every year. Alas, we went to Applebee’s for dessert (where I thought I had a gift card), but I must have misplaced it. The Banana Cracker Jack Cheesecake was decadent. Jessica(14) enjoyed her triple chocolate meltdown which was chocolate intoxication in the best way possible. Mariah had the oreo cookie shake, which she enjoyed immensely. Elizabeth (12) also enjoyed the Banana Cracker Jack Cheesecake, and was likely grateful she didn’t need to share much of hers, since I had some. Dessert was a nice affair, and one of the few times I’ve fed the kids dessert before dinner…but that’s part of the fun of being an aunt;-). Now, for the knitting. No ripping out this week. In fact, as I sat down for about an hour wait today for a class requirement that was borderline insulting. It’s English 201 and I write for fun. Think about it. It’s always good to have someone else with a good eye look over your work, but this should have been extra credit, not a requirement. I would have been more willing to go if it was extra credit, because then it is a choice. Instead, I sat down with my knitting, and polished off a couple more repeats of the instep expansion. I had time for one more row earlier. I chose not to start it as it would have been a yarn over row. I prefer to save that work for when I can complete the next row when possible. 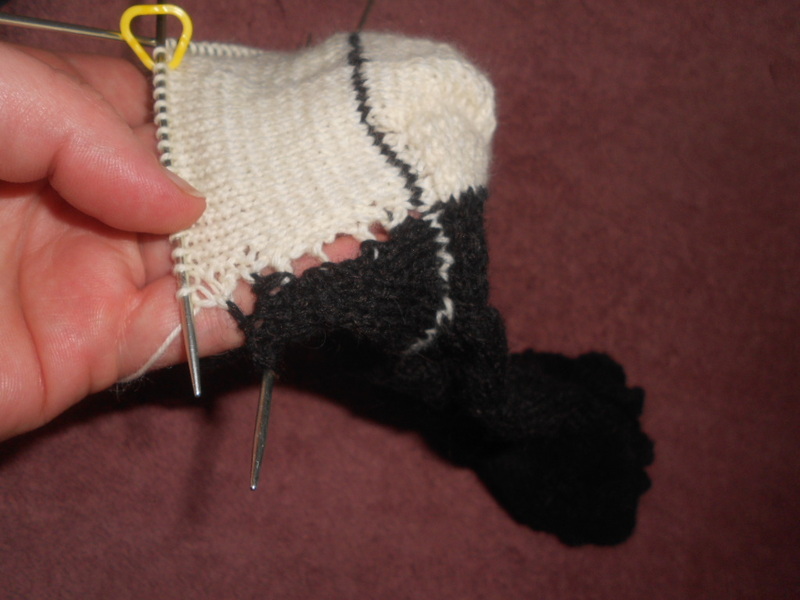 Current progress on the socks…look, look, I’m almost back to the heel! It worked out, and since I didn’t get to more knitting this evening as I made the greens and decided how to cook the chicken with a strawberry-papaya and an avocado…well, dinner is an interesting mix of flavors. Perhaps next time I’ll leave out the amaranth and chicken broth, keep the walnuts and put it all over romaine lettuce. It’s good, but I think it will be better as a slightly warmed bit of food over crisp lettuce. Two more, wait, no, three…or two and three-fifths more repeats to go before I start on the heel. I’ll get there. Now, back to the socks, I thought about trying them on, but will save that for next week, when the English class “Culinary Curve Balls” are hopefully over and I get to do a happy dance and prepare for Quilt week. Which reminds me of a story…hopefully the nieces don’t read this far–but she’s already half onto me. Darn it. The Cat, deciding whether or not she’s claiming the entire bag, or sneaking out to inform my niece about this Super-Secret fantasy project…. I was only expecting the younger niece this week, not the older one-whom I’ve been working on a Super-Secret Fantasy Project for some time. The Super Secret Fantasy project had been laid out for some time while I tweaked it and planned it. I work on the simple and portable parts at work to keep from going bonkers on breaks. I plan them out and take care of the big tweaks at home in my “spare” time. Silly me was not prepared for a fourteen year old to investigate my craft room–which she would at some point, and not leaving it to chance, I simply banned her from the room. Not all three girls, which would have been smart–but just the one I’ve been working on the project for. Let the twenty questions begin. That cat opened the damned bag before I could tie it shut. Not entirely, but she’s a decent guesser, so I reminded her of all the things I know how to sew. I think I’m going to have to gift her some surprise scrapbook pages for the birthday or Christmas. Let’s hope I have better luck getting to the heel of these socks soon! 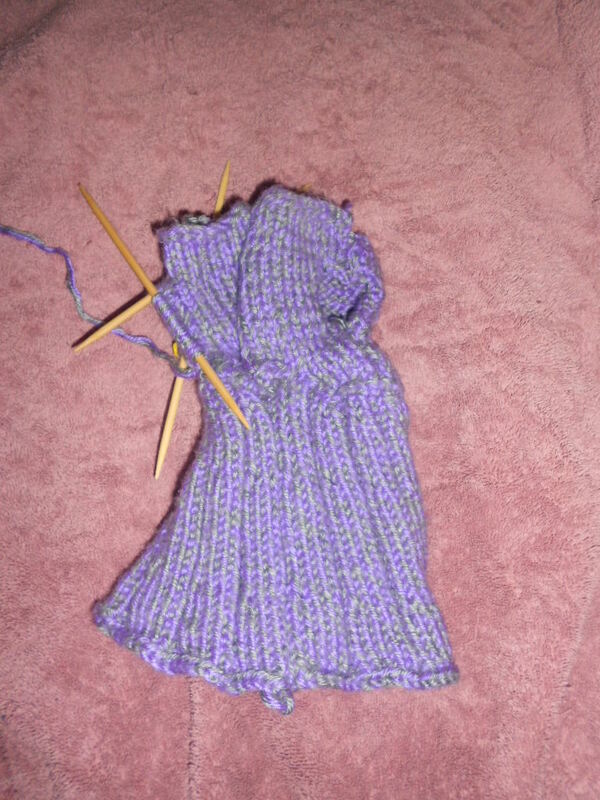 …Knitting…so long as I have yarn and needles. The week of “I don’t want to…” turned into a week of “Now, you have to…” Of course, it also helps that I’m not feeling so broke I’m afraid to use my spare change to buy a candy bar. So, the bills have to be paid, licenses still have to be renewed, uniforms still have to be exchanged and the oil in the car needs to be changed. It was a bit of a busy, early morning for me, that started around 2:30PM. 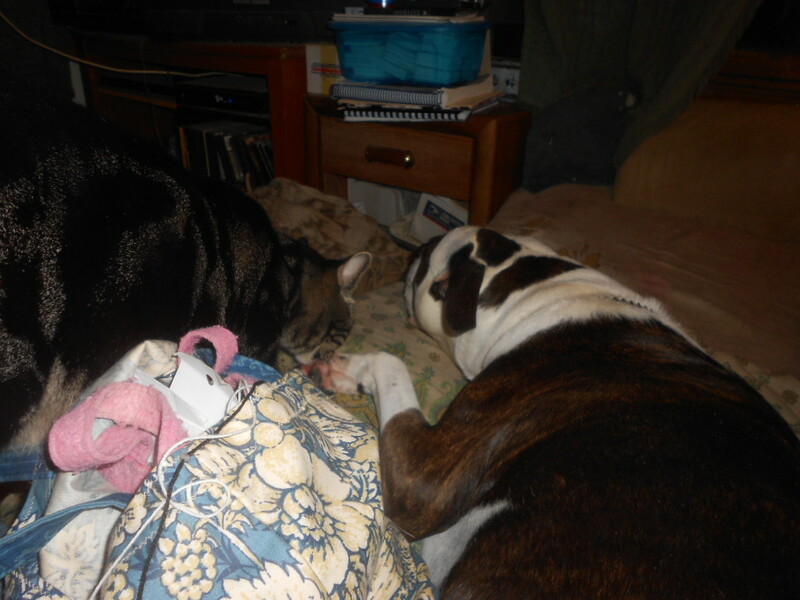 Briannag and Squib snuggling with each other as I knit…Squib is still an Official Knitting Inspector. But today, I got the uniforms exchanged, so they will not unravel at work. I read more of the book as I got the oil changed (yes, I utilize a mechanic. My strengths lie with yarn and telling tales-tall or true, not car parts;-)). I also stopped off at the library to print off some forms I needed and got a walk in with Dear James and the puppies. In addition, I agreed to cook. In all fairness, its my turn, and I like to cook. Once I got dinner in the oven, I had a decision to make, knitting or writing. I still need to make my word count tonight. But I can write when I’m tired…(famous last words). I know for certain I should not knit tired. So, knitting wins. 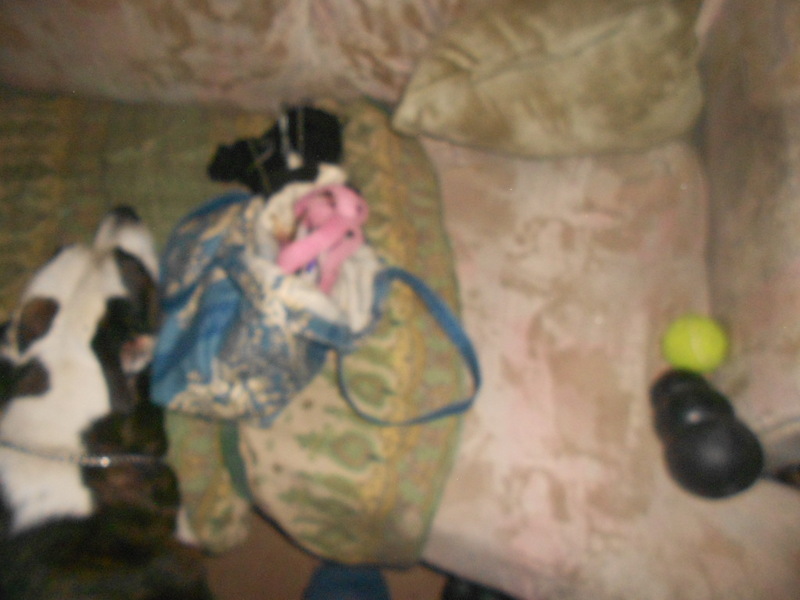 And I was reminded as the dog lay there and whimpered at me to either love her or share the wine…the knitting is always right there. It was simply waiting for me to pick up, check where I left off and knit on. I even began to feel like I’m making progress with this sock, which likely means I’m past the halfway point of the foot. 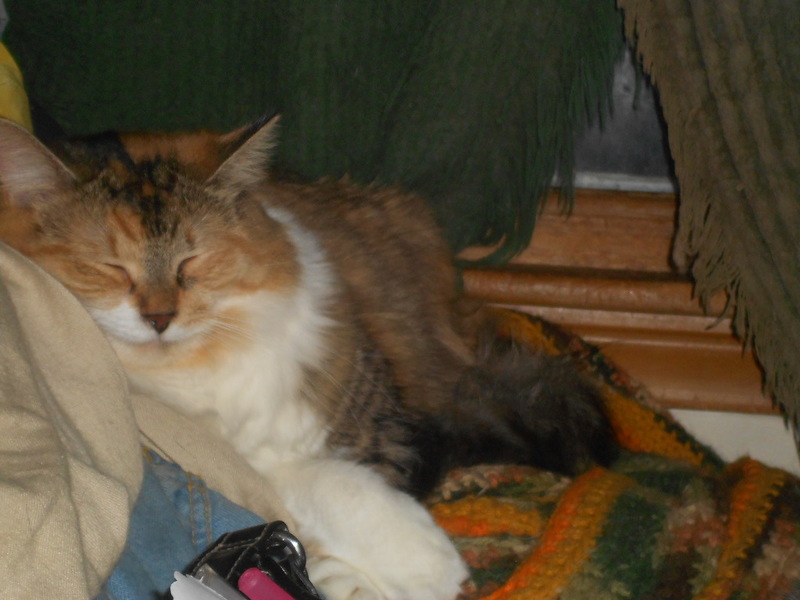 Scamp, sleeping through my knitting…However, a skein of yarn escaped the bag. I’m really concerned she’s going to wake up and run off with it. I am not Wonder Woman by any means. However, between my to-do list, the fairy garden I’m working on(of which I do not have many more pictures), the changes being made to the super-secret quilt I’m working on(more in another blog…there isn’t room here), the knitting and extra days at work…I’ve become a busy woman who feels a bit like the Wonder Woman who simply tries to do too much. I’ll get to it, and some enjoyment-as, what’s life without enjoyment. But I will feel every inch of it in the meantime. I’m so glad I’ve already turned the oven off. 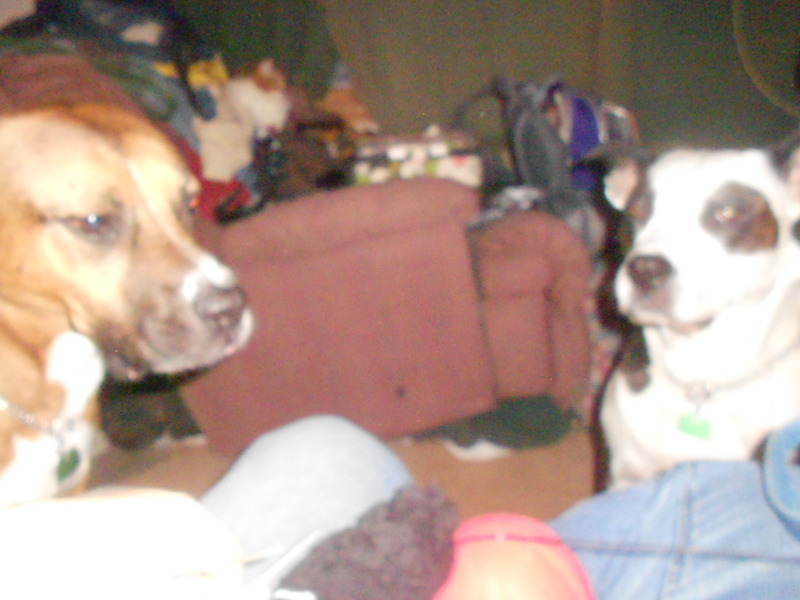 I hope you enjoy the kitties and puppies and their help with the knitting. 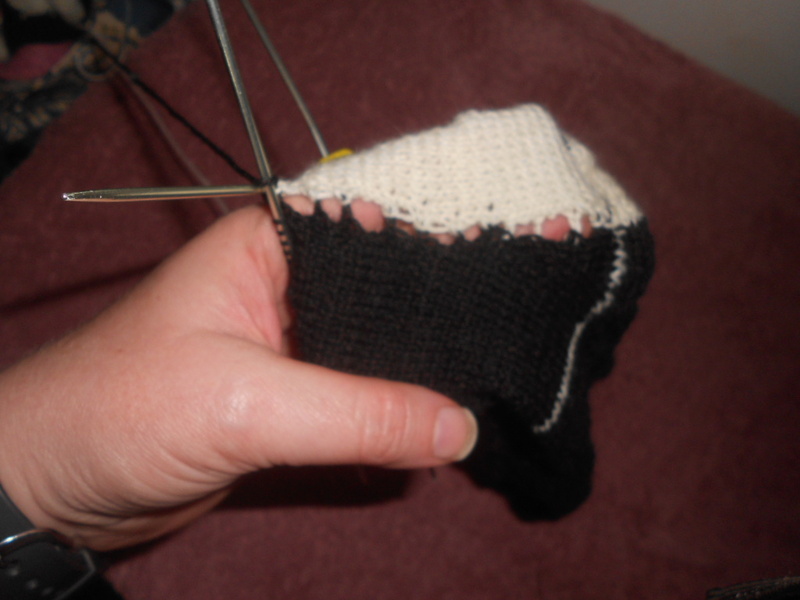 Sock progress…It’s getting there, really. Then I consider learning how to really crochet, via a 1 hour coffee cup cozy, to start. Not tonight, though; I’ve been busy enough. I must finish the fifteen hundred words for today that I decided I could write tired. This may require some wine. In the meantime, I still have knitting. Current look of the bi-color sock. 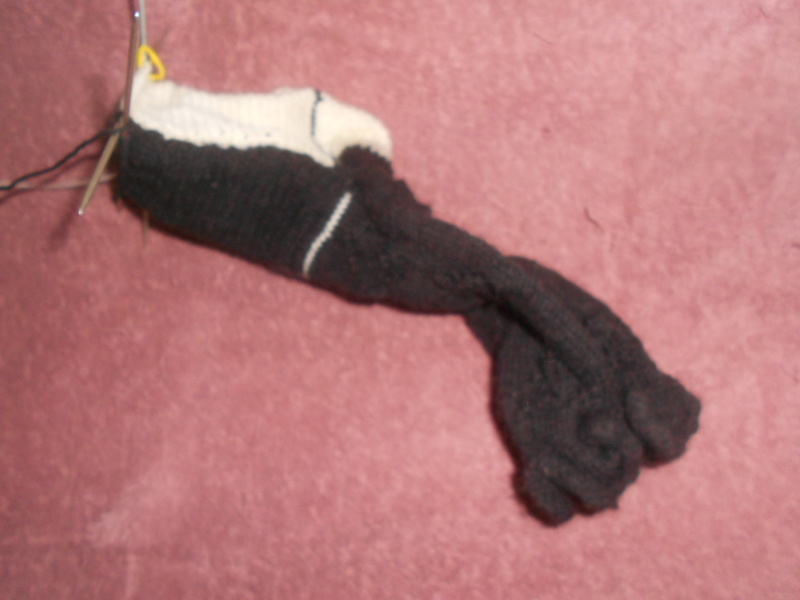 I will return to the socks I’ve been discussing in a week or two. Let me share a story. I like to write. In my spare time, while I was employed steadily, I wrote stories about characters for my nieces, Jessica and Elizabeth.. I named the characters Sunny and Moonbeam and made them to look like my nieces. They have had some fun adventures in these stories, including meeting dragons I have sewn for my nieces. The dragons are Stella, the Brave, and Capice, the Understanding. In one of these stories, it seems I promised to make my nieces doll clothes for Sunny and Moonbeam. I must tread carefully here, as I may have promised them sewn doll clothes. So, what is sewing doing in a knitting blog? No more than it has to be. I like to sew from time to time. I have discovered I do not care for sewing doll clothes. All those short, small seams drive me half crazy. But it couldn’t be too bad to knit Sunny and Moonbeam a dress, could it? So, I googled free knit doll dress patterns, or some such order of those words. I found some pretty patterns, and I printed a few off. I don’t think I’ve printed off the one my boyfriend thought was too old-ladyish. If I did, I’m saving it for after the prettier dresses. But it was a pretty dress. Alas, I settled on a pretty looking dress with a cowl neckline, then I began to unravel a doll blanket I’d knitted on the Knifty Knitter ™ Loom years ago, that I have not used since my nieces were moved to Florida. I chose a purple and gray combination because I think its pretty, and my youngest niece likes purple. I hope the color combos aren’t too old-ladyish, but second and third graders seemed to like it when I was knitting in class, so I think I’m okay. I read the pattern after I printed it off. It wasn’t written traditionally, but it was in steps. I figured I could work with it. The bodice front was a little confusing, but worked out in the end. 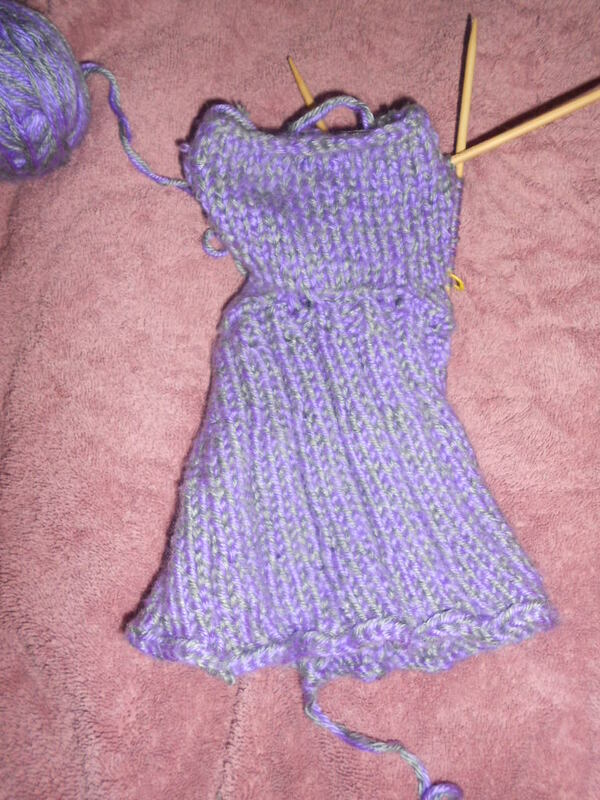 The bodice back, well the first one I knit went well. I did what it said and it worked out. The second one, with checking, was confusing, and written exactly the same as the first except that the cast off stitches happen one row lower on a purl row instead of a knit row. Apparently, this is supposed to give you the sides. I’m not sure if it did or not. I still don’t know which one I knit first or second or which was supposed to be left or right. I got confused, and had to rework this twice, before I simply laid it against the bodice with its counterpart and knit to match. If this was not being done due to a promise I was reminded of, I would not have continued with this pattern. I would either have tried another, or given up and hand-sewed the doll clothes. I still may hand-sew some doll clothes, but I wish to finish some other projects first. Once the bodice pieces were finished and joined, I began to pick up stitches to add the skirt on. I realized at this point, that the pattern designer must prefer flat needles. When I’m making a round piece, I much prefer double-pointed needles. I adjusted the pattern for such, making it easier as I just had to knit, and slip in ribs at even intervals and remember where to increase. I used tally marks to track my rows, as is my habit. The skirt went easier than the bodice for certain, but it is a larger piece. 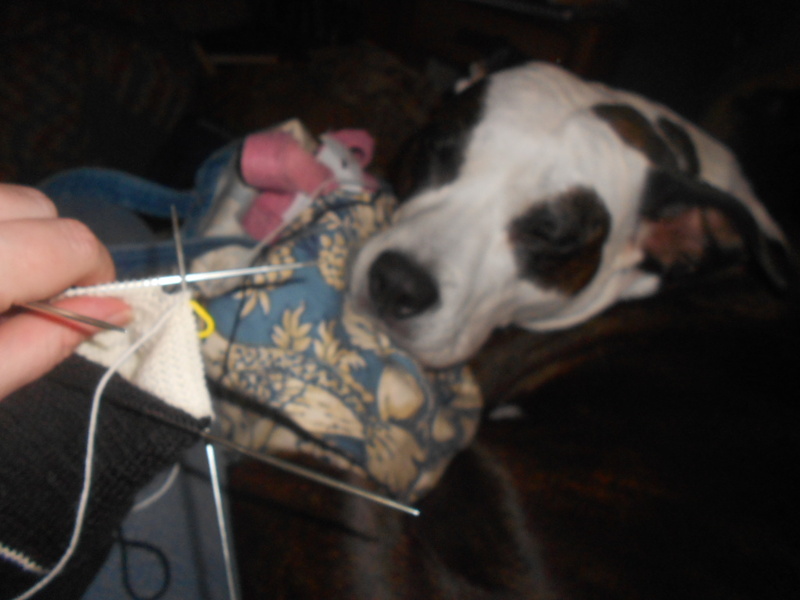 I began with 52 stitches, and increased in 13 stitch increments to 91 stitches during the last few rows. Even for only six rows, 91 stitches, with a 2 purl rib or not, can feel like it takes forever. But it did get finished. I then went on to knit the sleeves and cowl later, which I will address in next week’s blog and then will return to the foot of the sock I am knitting. I hope to be at the toe or finished with it soon so I may begin the second sock. I think they have quite a valid point. Tea and Haggis Chips with Jenn McQuiston.